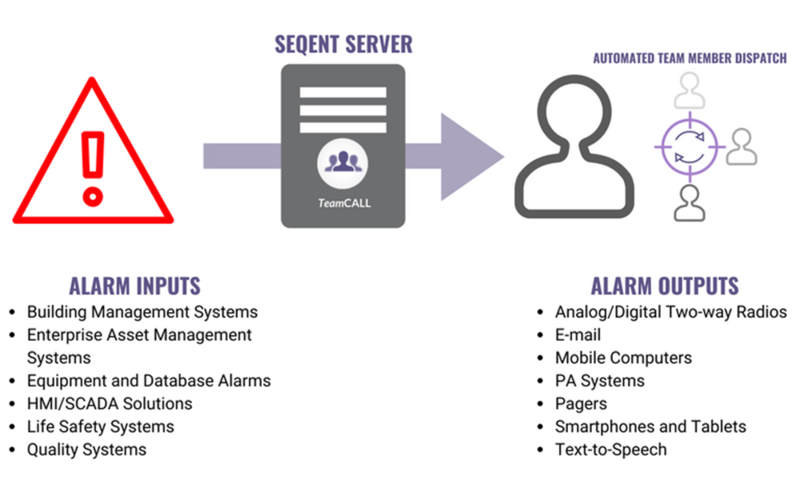 SeQent’s TeamCALL (TC) product line adds Automated Team Member Dispatch and Scheduling to our FirstPAGE product line. TeamCALL Server, combined with various TeamCALL Gateways or user developed applications utilizing the SDK, automates the assignment, dispatch and monitoring of team requests. The TeamCALL Server provides an easy to use interface for team leaders and supervisors to configure the system to automatically dispatch the next available qualified team member to a problem situation. Automatic reminders and escalation ensure that the events are handled in a timely fashion. TeamCALL requires three states for events to be dispatched: call, attended and cleared. For applications such as a Trouble Ticket System (ServiceNow) or an Enterprise Asset Management System (MAXIMO) the creation of a ticket/work order will constitute the call, the acceptance of the ticket/workorder by the team member attended and the closing of the ticket/workorder clearing. For call button based solutions a three state button can be utilized to perform these same steps. TeamCALL sends messages/requests to skilled trades informing them that a task has been assigned to them and manages these in a batting order rotation. TeamCALL Server is the core of SeQent’s automated team management and coordination solution. TeamCALL Server provides team membership, schedule management, and real-time notification management. The unique features of TeamCALL allow automated team member assignment and dispatch while enabling real-time access to team member location. Starting with TeamCALL Server as the foundation, select one or more applications to add automated team member dispatch and scheduling. ActiveX SDK provides an easy to use interface for adding the power of TeamCALL team management to any request based system. Full web-based administration for all team and schedule management. Gateway for ServiceNow provides a bridge between ServiceNow and TeamCALL.